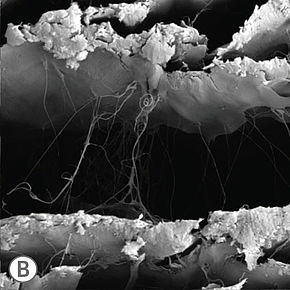 As a result of different surface characteristics, barrier membranes are modified to stimulate certain biological responses (DIMITRIOU et al., 2012). 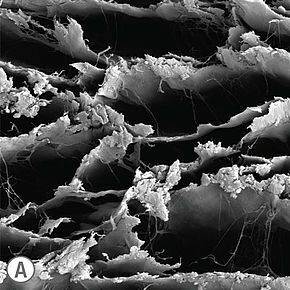 Along with the intramembranous porosity and interconnectivity (DIMITRIOU et al., 2012), the surface design of barrier membranes is a feature that can be modified. The surface characteristics of the BEGO Collagen Membrane have been adapted to the two tissue types between which they are placed (Fig. 3). The dense and compact structure without obvious access to the membrane interior is characteristic of the smooth side of the BEGO Collagen Membrane (Fig. 3). The smooth surface serves to occlude connective tissue cells. The dense texture of the smooth side does not contain any pores or penetrating perforations that would allow connective tissue cells to migrate into the space beneath the membrane where the bone regeneration takes place. At the same time, thanks to its thinness, the BEGO Collagen Membrane meets the requirement for permeability to nutrients to provide nutrition to the zone beneath the membrane. 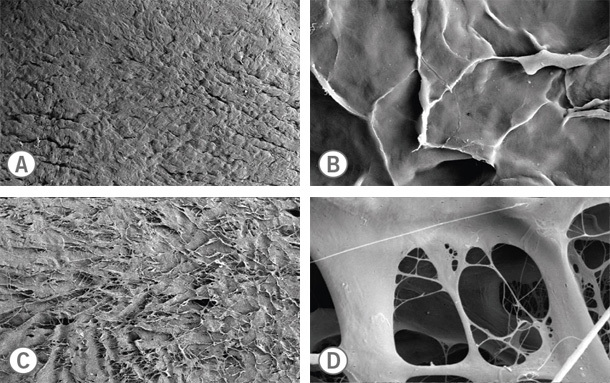 The rough side of the BEGO Collagen Membrane has a compact but clearly open porous character with many connections to the interior of the membrane (compare Fig. 2 and Fig. 3). The rough surface character satisfies the requirement for osteoconductivity and allows the migration of cells from the nearby bone bed (Fig. 3; C, D). Fig. 2: REM image of the internal structure of the BEGO Collagen Membrane. The porous internal structure of the BEGO Collagen Membrane resembles a honeycomb (A). B shows a detailed magnification of A in which the collagen filaments that stabilize the individual honeycomb-like cells can be clearly seen. Fig. 3: The dense, non-porous surface of the smooth side of the BEGO Collagen Membrane does not have any connections into the interior of the membrane with a similar size to cells (A, B). The rough side of the membrane has a clearly open porous surface with complex interconnection links to the interior of the membrane (C, D).